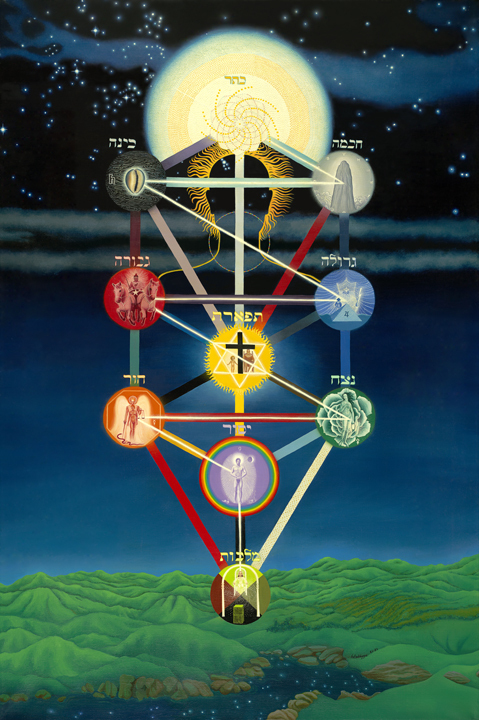 The Kabbalistic Tree of Life is available as a poster. It is a digital print, 26" X 18", and costs $15. If you click the Buy Now button, you will be taken to a secure PayPal page to order and pay. I will pack and ship the poster within 1 week. I currently live in a remote location, and the post office is a 10-mile round trip, so I need to combine the drive with other errands. Postage varies: If you are in the United States, I'll send the poster via Priority Mail. I use International First Class shipping to all other countries in the world. Time of delivery varies by country and can take 1 to 6 weeks. For some reason, the mail has been slow to France and Germany. If you live on a faraway island somewhere, be patient and hopefully the mail will come through. The US Postal Service recently started scanning mailing tubes of the size I use, so that has slowed delivery a bit. To order multiple posters: Don't use the Buy Now button, which is only for single posters. Please e-mail me at info@patriciawaldygo.com and tell me how many posters you would like. Then I'll send an invoice to you via PayPal. You can save a lot on postage by ordering multiples, but how much you save depends on your location (U.S. or international), the size of the mailing tube, and the size of the order. I'll e-mail you the specifics for your order before sending an invoice, so that we can work out the cheapest method. There is a 10 percent discount for ordering 20 to 49 posters, and a 15 percent discount for 50 or more posters. For any problems with PayPal or other issues, please contact me at info@patriciawaldygo.com.